Welcome to 5 Room Dungeons oh Intrepid Game Master! Below is revealed my specific way to build sessions, adventures and even campaigns using a simple design method you can learn in just a few minutes. The complete 5 Room Dungeon method is laid out for you on this page. In addition, I've assembled a 317 page book brimming with 87 example 5 Room Dungeons plus dozens of pages proving you 5 Room Dungeon design assistance and inspiration. You can get the 5 Room Dungeon book free when you subscribe to my weekly GM tips newsletter that goes deeper into adventure design, campaign building, and mastering your GM craft. 5 Room Dungeons was my solution for combining the mythic story structure of legendary scholar Joseph Campbell and my quest for quick and easy adventure design. This simple framework gives you everything you need to build a great evening of adventure for your friends. Because of its built-in story structure, which you'll find present in everything from Star Wars to Game of Thrones, you don't have to worry about how to build drama or hook characters deeper into your plot. 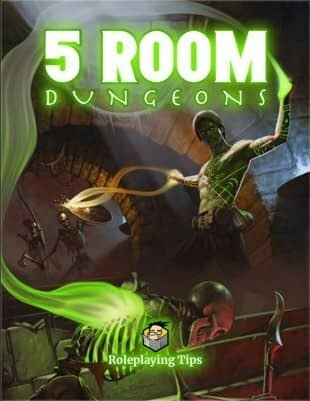 The 5 Room Dungeon format has that baked in, plus clear guidance on what encounters to build and what kind they should be. Don't Have Time to Read This Whole Page Right Now? Download the book and get my weekly GM tips newsletter. Includes the full template plus 87 example 5 Room Dungeons. Plus a horde of tips on how to design and run 5 Room Dungeons. There's been a bit of confusion about how to use this quick adventure building method. When I invented this framework in 2002-2003, I was thinking it would work for all adventure types. I named it 5 Room Dungeons, which in hindsight is why many game masters don't think this format will work for their non-dungeon campaigns. All game systems: D&D, Pathfinder, FATE, PtBA, Savage Worlds, 13th Age, etc. Each room in the five room dungeon template guides you through the stages of building a complete story. It's the story framework that matters most for great gaming. The genre, game system, setting, character types, and other details do not matter. You can use the 5 Room Dungeon story framework for your campaign, guaranteed. Why Like 5 Room Dungeons? Though I call them 5 Room Dungeons, they apply to any location with five or so areas. They don’t have to be fantasy or dungeons. They could take the form of a small space craft, a floor in a business tower, a wing of a mansion, a camp site, a neighbourhood. Many players dislike long dungeon crawls, and ADD GMs like to switch environments up often. In addition, some players dislike dungeons all together, but will go along with the play if they know it’s just a short romp. This helps ease conflicts between play styles and desires. Large designs often take so long to complete that game night arrives before you can return to the beginning and do one or more rounds of tweaking and polishing. The design speed of 5 Room Dungeons leaves room most of the time to iterate. 5 Room Dungeons can squeeze into many places larger locations and designs can’t. If your dungeon goes unused or if you want to pick it up and drop it on a new path the PCs take, it’s often easier to do than when wielding a larger crawl. A two to four-hour dungeon romp quickens flagging campaign and session pacing, and can be squeezed into almost any story thread. It also grants a quick success (or failure) to keep the players engaged. The format is also easy to drop into most settings with minimal consistency issues. There needs to be a reason why your dungeon hasn’t been plundered before or why the PCs are the heroes for the job. A guardian or challenge at the entrance is a good justification why the location remains intact. Also, a guardian sets up early action to capture player interest and energize a session. The entrance is cleverly hidden. The entrance requires a special key, such as a ceremony, command word, or physical object. The guardian was deliberately placed to keep intruders out. Examples: a golem, robot, or electric fence. The guardian is not indigenous to the dungeon and is a tough creature or force who’s made its lair in room one. The entrance is hazardous and requires special skills and equipment to bypass. For example: radiation leaks, security clearance, wall of fire. Room One is also your opportunity to establish mood and theme to your dungeon, so dress it up with care. The PCs are victorious over the challenge of the first room and are now presented with a trial that cannot be solved with steel. This keeps problem solvers in your group happy and breaks the action up for good pacing. Make Room Two a puzzle, skill-based, or roleplaying encounter, if possible. Room Two should shine the limelight on different PCs than Room One, change gameplay up, and offer variety between the challenge at the entrance and the challenge at the end. Note, if Room One was this type of encounter, then feel free to make Room Two combat-oriented. Room Two should allow for multiple solutions to prevent the game from stalling. Magic puzzle, such as a chessboard tile floor with special squares. An AI blocks access to the rest of the complex and must be befriended, not fought. A buzzer panel for all the apartments, but the person the PCs are looking for has listed themselves under a different name, which can be figured out through previous clues you’ve dropped. A concierge at the front desk must be bluffed or coerced without him raising the alarm. The PCs must convince a bouncer to let them in without confiscating their weapons. Once you’ve figured out what Room Two is, try to plant one or more clues in Room One about potential solutions. This ties the adventure together a little tighter, will delight the problem solvers, and can be a back-up for you if the players get stuck. The purpose of this room is to build tension. Do this using a trick, trap, or setback. For example, after defeating a tough monster, and players think they’ve finally found the treasure and achieved their goal, they learn they’ve been tricked and the room is a false crypt. Depending on your game system, use this room to cater to any player or character types not yet served by the first two areas. Alternatively, give your group a double-dose of gameplay that they enjoy the most, such as more combat or roleplaying. The PCs rescue several prisoners or hostages. However, the victims might be enemies in disguise, are booby-trapped, or create a dilemma as they plead to be escorted back to safety immediately. A collapsed structure blocks part of the area. The debris is dangerous and blocks nothing of importance, another trap, or a new threat. Contains a one-way exit (the PCs must return and deal with Rooms One and Two again). i.e. Teleport trap, one-way door, 2000 foot water slide trap. The PCs finally find the artifact required to defeat the villain, but the artifact is broken, cursed, or has parts missing, and clues reveal a solution lies ahead. Believing the object of the quest now lays within easy reach, an NPC companion turns traitor and betrays the PCs. Another potential payoff for Room Three is to weaken the PCs as build-up to a dramatic struggle in Room Four. It might contain a tough combat encounter, take down a key defense, exhaust an important resource, or make the party susceptible to a certain type of attack. For example, if Room Four contains a mummy whose secret weakness is fire, then make Room Three a troll lair (or another creature susceptible to fire) so the PCs might be tempted to burn off a lot of their fire magic, oil, and other flammable resources. This would turn a plain old troll battle into a gotcha once the PCs hit Room Four and realize they are out of fire resources. Don’t forget to dress Room Three up with your theme elements. This room is The Big Show. It’s the final combat or conflict encounter of the dungeon. Use all the tactics you can summon to make this encounter memorable and entertaining. As always, generate interesting terrain that will impact the battle. Start or end with roleplay. Maybe the bad guy needs to stall for time to let PC buffs wear out, to wait for help to arrive, or to stir himself into a rage. Perhaps the combat ends with the bad guy bleeding to death and a few short words can be exchanged, or there are helpless minions or prisoners to roleplay with once the threat is dealt with. Give the bad guy unexpected powers, abilities, or equipment. Previous rooms might contain warning signals or an alarm, so the bad guy has had time to prepare. The bay guys try to settle things in an unusual way, such as through a wager or a duel. The lair is trapped. The bad guy knows what or where to avoid, or can set off the traps at opportune moments. The bad guy reveals The Big Reward and threatens to break it or put it out of the PCs’ so reach so they’ll never collect it. The bad guy has a secret weakness that the PCs figure out how to exploit. A variety of PC skills and talents are required to successfully complete the encounter. Room Five doesn’t always represent a complication or point of failure for the PCs, but it can. Room Five doesn’t always need to be a physical location either - it can be a twist revealed in Room Four. 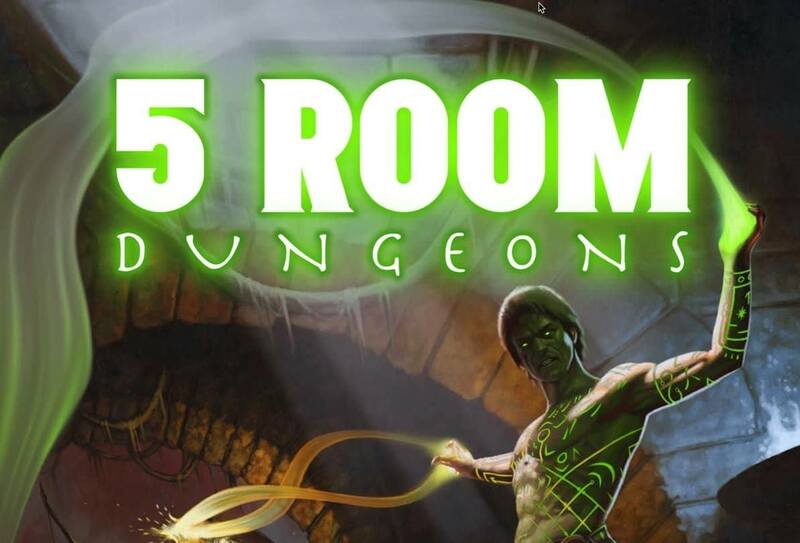 Room Five is where your creativity can shine and is often what will make the dungeon different and memorable from the other crawls in your campaigns. In addition, if you haven’t supplied the reward yet for conquering the dungeon, here is a good place to put the object of the quest, chests of loot, or the valuable information the PCs need to save the kingdom. As accounting tasks take over from recent, thrilling, combat tasks, this would also be a good time to make a campaign or world revelation, or a plot twist. Perhaps the location of the next 5 Room Dungeon is uncovered, along with sufficient motivation to accept the quest. Maybe the identity of the bad guy is revealed. New clues and information pertaining to a major plot arc might be embedded in the treasure, perhaps sewn into a valuable carpet, drawn in painting, or written on a slip of paper stuffed into a scroll tube or encoded on a data chip. Another guardian awaits in the treasure container. A trap that resurrects or renews the challenge from Room Four. Bonus treasure is discovered that leads to another adventure, such as a piece of a magic item or a map fragment. A rival enters and tries to steal the reward while the PCs are weakened after the big challenge of Room Four. The object of the quest/final reward isn’t what it seems or has a complication. i.e. The kidnapped king doesn’t want to return. The quest was a trick. By killing the dungeon’s bad guy, the PCs have helped the campaign villain or a rival. Perhaps the bad guy was a good guy under a curse, transformed, or placed into difficult circumstances. The bad guy turns out to be a PC’s father. The true, gruesome meaning behind a national holiday is discovered. The source of an alien race’s hostility towards others is uncovered, transforming them from villains to sympathetic characters in the story. The true meaning of the prophecy or poem that lead the PCs to the dungeon is finally understood, and it’s not what the PCs thought. You can get this 317 page book free now when you sign up for my weekly game master tips newsletter, which is Patron support and also no cost to you. Would you like to see some examples? I've got 87 example 5 Room Dungeons created by Roleplaying Tips Readers.